Over the winter holidays, Terra Informa will be re-broadcasting our three part series Between the Devil and the Deep Blue Sea. Thanks for listening! 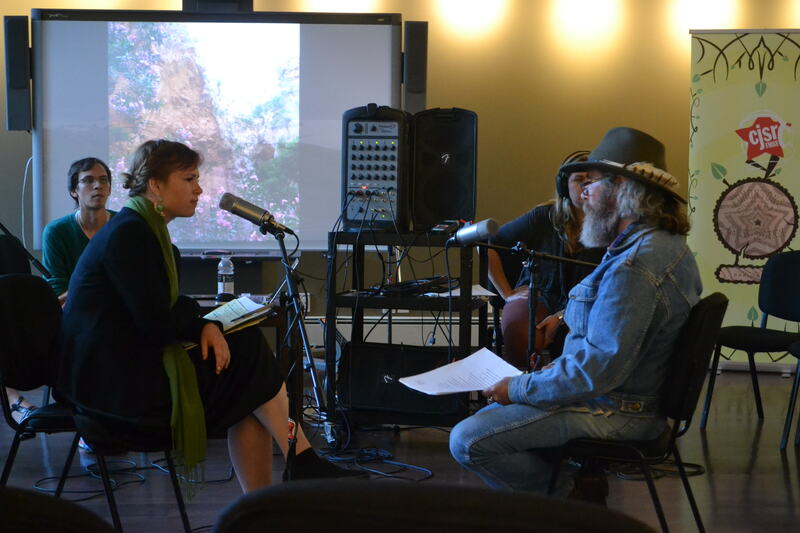 Terra Informer Morgana Folkmann interviews Gary Lee about his work. In a show recorded before a live audience, Terra Informa brings you stories of spirituality and the way it shapes our attitudes to the natural world. Act Two brings you poetry about Alberta’s landscape and history from Edmonton-based poet Gary Lee, plus stories about faith and our environment from the audience, and another song from singer-songwriter Sierra Jamerson. Tune in next week for the final act, recorded live at Edmonton’s St. John’s Institute. What connects you to a place, causes you to push your roots deep down into it? Are you captured by the rich smell of the soil? By the sight of open skies? Or — is it the realization and enormity of all that has happened beneath your feet? No matter where you’re from, or who you are, people find profound connections to the world around them. Gary Lee, is an Edmonton-based poet, painter, videographer and musician. Gary has travelled around Canada by thumb and by Greyhound, working as a janitor, proofreader, counter-fitter, grain bin builder, addictions worker, maintenance man, sound man, roadie, psychiatric aide, itinerant guerrilla poet, performance artist and musical saboteur. Our own Morgana Folkmann has known Gary Lee since his days as a hitchhiking bard across Canada. We heard them in conversation, as Gary recited his poems Upon This Rock and Power Spot. Host Nikki Wiart asks members of the audience and the Terra Informa crew some questions about faith and nature. What spiritual experiences with nature have you had? Is there a place in nature that speaks to you? Are you part of a faith tradition – and if so, what is the opinion or attitude of that faith toward the environment? Sierra Jamerson was born into a family of talented leaders as well as gifted musicians, and she’s been performing professionally since the tender age of eleven, singing traditional Black Gospel, jazz, soul and R&B music. Part of that talented family of hers is Tahltan Nation from BC. You might have heard of the Sacred Headwaters in Tahltan territory. It’s the origin point for three powerful rivers that run through British Columbia – the Stikine, the Skeena and the Nass. When natural gas and coal exploration started on their land a few decades ago, her family had something to say about that. In this act, she performs her original song She’s Gonna Save the World, a tribute to the powerful women she’s been inspired by, among community leaders and her family.